The dismal state of the academic labor market has been critiqued for years at this point. Those of us who began our doctorates before contingent labor became the norm, back when there were still jobs to be had, finished our doctorates with no hope for a career in sight. So, we took jobs in contingent positions under poor working conditions. Some of us—most of us—left. Some of us who left then wrote about it. These essays about leaving academia became a genre, and the genre gained a name: “quit lit,” which was, as far as I can tell, first coined in this context by higher education critic Dr. Rebecca Schuman in Slate in October 2013. Rebecca Schuman wrote an early piece of academic quit lit for Slate in April 2013. In “Thesis Hatement,” Schuman does three main things: she warns readers not to go to graduate school: “Don't do it. Just don't.” She tells them why: “I now realize graduate school was a terrible idea because the full‐time, tenure‐track literature professorship is extinct.” And she describes the pain she suffered as she trained for a career that was never going to manifest: “During graduate school, you will be broken down and reconfigured in the image of the academy … your academic self will be the culmination of your entire self, and thus you will believe, incomprehensibly, that not having a tenure‐track job makes you worthless.” These three arguments—warning, critique and description of suffering—comprise the genre of quit lit. In her essay, Schuman doesn't hedge. She doesn't say there are “fewer” jobs. She says there are no jobs. Because, as she points out, in her discipline there are 150 applicants a year for six positions worldwide. With those numbers, the difference between few and none is no difference at all. Despite its grimness, Schuman's essay is inspiring as well. She inspired me to write and publish my first nonacademic essay as I was inching toward the exit of higher ed. That essay was a litany of the small, daily humiliations of being a contingent faculty member. But in retrospect, that piece was also setting up the evidence I would use when I finally quit. That essay proved why life as contingent academic labor in the contemporary university is, for the most part, as untenable as Schuman described. Over the years, my quit lit friends have gone their separate ways and found success in their new chosen fields: journalism, writing, editing, real estate (and writing!) and more. The fire that drove us away from the academy in the days of the rise of the academic precariat—and the attendant rise of quit lit—cooled to a slow burn. Because that's what drove quit lit in the beginning. Quit lit, at its heart, was a labor critique. It's five years later, and something new has happened. 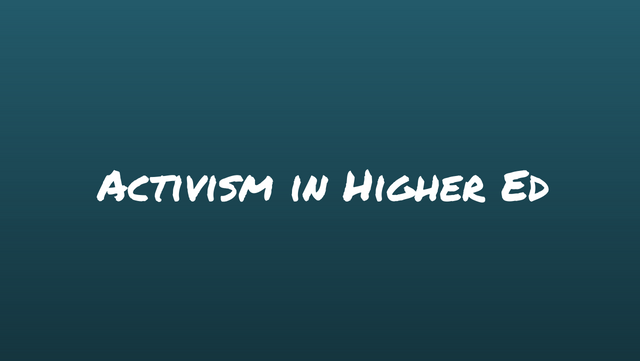 In February 2018, The Chronicle of Higher Education republished a blog essay by Dr. Erin Bartram, a historian, who wrote about leaving academia after years in a contingent faculty position and failure on the job market. Titled “Why Everybody Loses When Someone Leaves Academe,” the essay opens with her final job rejection. She leaves her office in her temporary department, described with all of the sentiment a professor can muster, including a drawer of fountain pen ink. And then her essay takes a surprising turn. Her indictment is not one of the dismal labor market, but rather one of her field (history) that allows losses of colleagues to continue because their contributions to research will be lost forever. She writes, “Even in our supportive responses to those leaving, we don't want to face what's being lost, so we try to find ways to tell people it hasn't all been in vain.” Later she writes, “We don't want these people to go, and we don't want to lose all the ideas floating around in their heads, so we say, ‘Please give us those ideas, at least. Please stay with us just a little bit.’” And she's right; when I left academia, my former colleagues said similar things to me. The piece garnered a massive response. There were response essays in CHE itself, which noted that Bartram's piece “generated a vesuvian outpouring of responses” and that the original blog post was read at least 80,000 times. By any metric, Bartram's piece struck a chord with readers. Obviously, her essay appeals to outsiders who have quit academia. But Bartram's piece is radically unlike Schuman's and others in a particular way that makes it appealing to more than just those who have been forced out of the academy. Bartram's essay also appeals to those who approve of the academic status quo because it maintains nostalgia for the academy itself. This nostalgia does not appear in Schuman's essay and other quit lit. Bartram doesn't speak to poor labor conditions and how working as contingent faculty can be back‐breaking and poverty‐inducing. She speaks to how much she'll miss her research and her chosen field. Bartram's essay doesn't provide a critique of the academic labor market, nor the poor working conditions. Indeed, she still speaks of her chosen field as though she were a part of it. She uses the first‐person plural “we”: “We don't want these people to go, and we don't want to lose all the ideas floating around in their heads.” In this essay, Bartram herself is still an insider. No wonder it was so appealing to so many—even while forced out, Bartram still looks upon the field with love. If quit lit is about labor, then the best quit lit published in the last year wasn't about quitting at all. In April 2018, Chronicle Vitae republished a blog post written by Dr. Annemarie Pérez on how an adjunct's current department can do material things to help that adjunct with her career—rather than continuing to exploit her. It was one of the few recent pieces I've read on contingent issues that still burned with fire about the dismal academic job market and the attendant labor exploitation. Quit lit does not tend to have the happy ending that Pérez's piece has—she landed a tenure‐track job after many years of adjuncting and with the mentorship she found in her temporary department. Bartram's piece has heart. But in the end, it maintains the status quo of academic life. Pérez's piece calls academics out for their gaslighting and provides concrete steps for fixing the problems we've been writing about for five years. But eighty thousand people haven't read Pérez's piece because it isn't an encomium to the academy. The academy doesn't need encomiums or casseroles. It needs practical labor critiques. Or there will be no insiders left.